With many OEM’s out of business or the details of their designs lost or out of reach due to closings, downsizing, and consolidation, many replacement parts are needed for which drawings are unavailable. Critical components deserve better than calipers and a hand mike, especially when they provide essential functionality to aerospace, automotive, or automated systems. PMPA Technical Member FARO Technologies provides this case study on use of their Faro Arm Platinum for shop floor measurement and data acquisition to reduce time to measure the parts and to assure key characteristics (like blended radii) are captured. 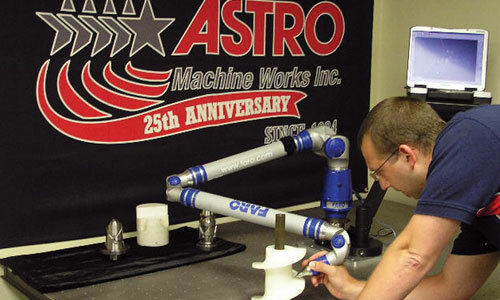 Headquartered in Ephrata, Pennsylvania, Astro Machine (www.astromachineworks.com) serves top regional and national companies like GE, Hershey, DuPont, Bayer, and the U.S. government. They serve industries such as aerospace, general manufacturing, medical, pharmaceutical, food processing, and energy. Each of Astro Machine’s different applications presents unique challenges, but their work in reverse engineering obsolete OEM parts was a particular challenge. These parts range in size from 1” cubes through 48” cubes and larger. Previously, AMW used older methods such as hand gages, calipers, micrometers, and protractors. These options proved to be ineffective since many of these OEM parts are very complicated, with an array of blended radiuses and compound angles. Manual tools, even when used carefully, resulted in “hit or miss” accuracy. AMW searched for a better solution for their metrology needs. They considered a conventional fixed CMM, but found a more versatile solution matched their needs: the 8-foot FaroArm® Platinum. This tool serves both in-process and final inspection functions, as well as reverse engineering. It can be taken directly onto the assembly floor and secured to custom machine assemblies while manufacturing is still in-process. This provides an integral inspection device that can aid in alignment and part position during various stages of assembly. The greatest value to Astro Machine with the FaroArm has been the massive time reduction in reverse engineering obsolete OEM parts. In many cases, the time has been reduced ten fold. “Prior to our FARO solution, it was not uncommon for our more sophisticated parts to take 8 to 50 hours to reverse engineer,” says Designer Dan Hughes. “This time has now been reduced to 30 minutes to 5 hours.” A reduction in time is a reduction in cost, which makes AMW even more valuable to their customers. Astro Machine invests heavily in its technology, and advancements are the cornerstone of their continuous improvement strategies. Not surprisingly then, the FaroArm was well accepted. The implementation process was very easy and the learning curve was extremely simple with the user friendly software. AMW uses their FaroArm on a regular basis for inspection purposes and at the outset of projects for reverse engineering. With the gained versatility of the FaroArm, no part is outside their capabilities. This entry was posted on Thursday, July 7th, 2011 at 3:16 am and is filed under Engineering, Front Office. You can follow any responses to this entry through the RSS 2.0 feed. You can leave a response, or trackback from your own site.